A wonderfully exfoliating wonder, that doesn't make my bathtub slippery or my skin feel like an oil slick (some are kind of pretty but I don't want to feel like one). My cauldron made a superb concoction out of the Raw Sugar, Distilled Water, Avocado Oil, Kokum Butter, Emulsifying Wax, Stearic Acid, Antimicrobial Preservative, Coconut Ginger Almond All Natural Fragrance Oil and Rosemary Extract that I included. I use the little wooden spoon to get the right amount, use the shower water to active it and scrub, scrub, scrub, then rinse! Utter magical perfection if I do say so myself! *This listing is for one 9 oz jar of product with one wooden spoon. **This product contains natural essential oils, which could cause reactions within those who have skin sensitivities. Individual results may vary depending on skin type, sensitivity, age, and skincare history. Please check the ingredient list for any potential allergens or known sensitivities. If any reactions occur, please discontinue use immediately. ***Thank you for visiting SoapWitchCrafts! Please check out the variety of items also currently available in my shop. 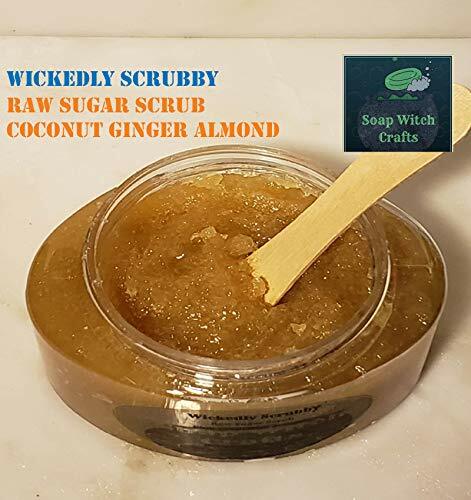 If you have any questions about this product by Soap Witch Crafts, contact us by completing and submitting the form below. If you are looking for a specif part number, please include it with your message.